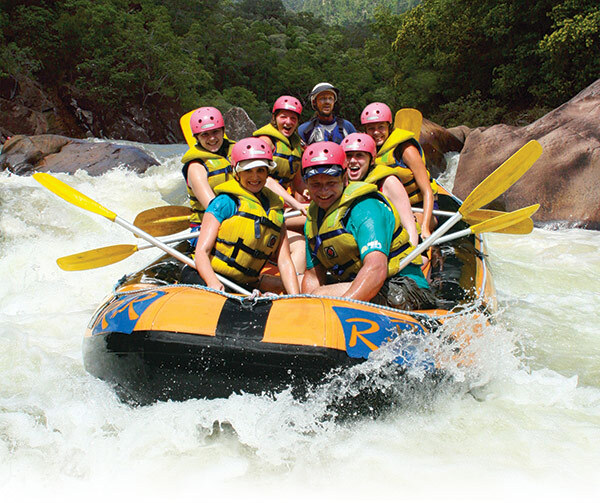 Experience the beauty surrounding the Barron River, rafting through pristine World Heritage listed rainforest situated only 20 minutes north of Cairns. Best fun we’ve had in a long time!!! Just did the half day rafting tour with my partner, on our way back to the hotel. It was truly a fantastic experience and we have had so much fun. Our guide Ben was absolutely amazing!! We admire the electrifiying energy and enthusiasm he puts in his job, having been in the business for more than 10 years. The whole staff are also helpful and friendly which made this an unforgettable experince! Would highly recommend!! Myself and my family had the best time with the team from RnR White Water Rafting, everything was organsied extremly well, a great bit thank you to our guide Macca he made the day, thanks for dumping Kelli over the side and actually getting Shane overboard as well great effort and thanks again. Highly recommend this Cairns activity. We had a wonderful family day out with our 2 kids (boy & girl aged 13 & 14). We were staying with family as we are from Alice Springs. The bus trip was comfortable with Lloyd our MC providing great info and safety instructions. Once out on the river - there were 9 rafts in our group (the bus was full! ), we had a great day despite it being a drizzly and cool day. Went rafting with my husband and parents and had a great trip! There were about 15 boats, which is quite a big group, but it was very organized and didn't have a "bus trip" feel at all. Everyone was very relaxed and organized, which helped the trip and stops to flow smoothly. We had breakfast on the way which was preordered once you get on the bus - definitely do this - and then lunch on the river at a camp they have. Just finished a full day on the tully river, our guide Tim was fantastic, ensuring that everyone had a great time. We were picked up early and started the two our drive to the river. We were given a full briefing of what to expect and how the day would run. After arriving we quickly let off down the river. Tim repeated the safely instructions and enured everyone felt comfortable.we had a great group on our raft and had lots of fun. A must do in Cairns! The best experience of my life! So much fun and really nice staff! Definitely worth doing and it can also easily be done on a rainy day where there isn't much else to do in cairns! Make sure you go on the full day trip. It is worth it! I don't think the half day trip would have been worth it because for the first few rapids it is mostly teaching.The guides are very helpful and truely concerned with your safety. Our guide, Marty, was hilarious and made the trip very fun. It was scary at times, especially when you fall out, but totally worth it! Make sure you listen to instructions so you know what to do! Action-packed rafting, great food and friendly staff....can't ask for more! A must do activity while you are in Cairns! We did the half day, and it was a decent experience. Its a pretty quick trip, but thats expected based on what's advertised. Unfortunately it's almost too short to really get into it. It takes a while for people without much rafting experience to get confident in even the basics, so while you do get to paddle a fair share, the guide seems to be doing a lot of the work. Wow, so much fun!! Its worth the $200 for the day. We had a great guide for the day which made it an awesome experience. The rapids were fairly easy with a few good drops which made it really good. The RnR Rafting team were very professional and made sure we had a safe day. On the down side, don't expect a photo, but you do get a chance to get photo images on a USB at a cost... But this is the norm these days. My friend & I booked a half day/ afternoon tour on the Baron river. 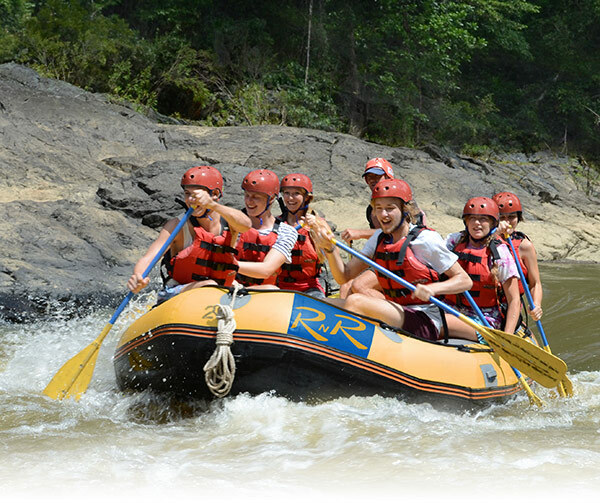 The guides were friendly & provided good safety & general rafting instruction. Our raft guide, Riley, was really experienced. Fortunately (I think) the river was really full from recent rain (apparently at 6.9m & the cancel once it gets to 7m) so the rapids were quite strong. This is one of the best things we did in Australia, it is a full day trip from Cairns to the Tully river, lunch is included in the form of a BBQ, you can hire shoes if you don't have appropriate footwear or don't want to get your trainers wet. The staff are friendly and good fun. You can buy a DVD and photos afterards which are expensive but well worth the cost. RnR and Raging Thunder seem to have merged and are now one company. I went down the Tully River with them. The river was great with exciting rapids and even a tall rock to jump off. Unfortunately, the staff left a little something to be desired. Our guide was pleasant, but didn't really add anything to the trip. My friends and I booked a hotel in Mission Beach to stay the night before the White Water Rafting in Tully River. We were then picked up by RnR at 7.30am, and arrived at the meeting point by 8.30am. By 9am, we were on a bus on the way to the starting point of the rafting trip. We were then divided into groups of 6 - based on our friends and our preference for the type of adventure we wanted. They wanted to know if we wanted just a normal-ish ride, or to have our raft turned over. Since we're not all very strong swimmers, we opted for the normal-ish ride. We had a great time on on our rafting adventure. The guides are very experienced and a lot of fun, they will make sure you get soaking wet. 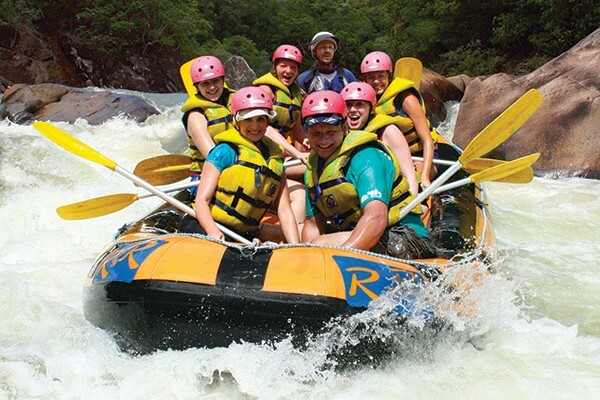 If you've been rafting before or it's you're first time, it a must do while you are there. This was oneof the best activities we did as a family. Lots of fun. Really good fun loving guides. This was one of the highlights of my time in Cairns. It's a long day but it was amazing fun. The coaches from Cairns drive down to Mission Beach to pick up people there before heading up to the Tully so if I were doing it again I'd have taken the trip from Mission Beach and gotten a lie-in. Our guide did his best to get us soaked at every opportunity, which was great. The river is apparently one of the best in Australia for rafting, Great day! Decided to go on a full days white water rafting on the Tully River with this company and they were great. The instructors made us feel very safe while ensuring we had fun but experienced as much as possible. We were picked up in Mission Beach and driven to Tully, from there we waited for a coach coming from Cairns with people and jumped on that coach, the journey from Tully town upto the river was only 30 mins and the coach was nice. During the drive one of the instructors gave a detailed safety briefing which was clear and concise. The helmets and life jackets were all good quality. A MUST do! Had an amazing time! White Water rafting was not even on the schedule when our front desk mentioned that it would be fun. We signed up with RnR Rafting and had the BEST time!! We did the Tully and had so much fun. We had the best tour guide (Macca) and loved going down the rapids. We were even given the chance to jump off a cliff and go down a bunch of rapids that were rock free. The guides interact with each other and have so much fun! The trip from Trinity Beach to the river is quite long, but definitely worthwhile. Our guide was great, we had loads of fun and I would not trade it for the world. If you're looking for adventure, this is one of the must do's while you're up there. I've done and would do it again any day. RnR is also the only company to my knowledge who does a DVD and Photos, you can get both the CD and DVD for $70 and yes it's worth keeping those memories 🙂 Lunch is good, if you like a good Aussie Burger and everything else is pretty well organised. 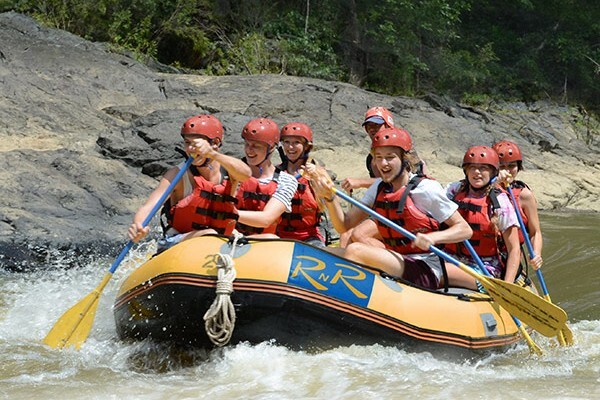 We booked with RnR Tully river full day rafting tour after a recommendation from a couple who came to rave about RnR to the tour office and we were glad that we did listen to them. The guides are all very experienced and fun. The whole day experience was a lot of fun and our guide, Callum, made all the difference. He was funny and friendly talking to all of us and telling crazy and funny stories, providing lots of information about the river and the rainforest. I had wanted to go white water rafting for so long...got to do it on my Aust. trip with some great friends and had the time of my life. Loved so much wanted to go again! Didn't want to leave!! We had lot of laughs along the way. This is a must to activiity to do...I would do it again in a heartbeat. My fiancé and I booked the trip on the Barron after reading reviews on here, and it was definitely worth it! Our guide was awesome which turned what would have been a good trip into a great trip. Overall since it was the dry season the water levels were low which made the rapids a bit small, so if you are going there in the dry season I might suggest the Tully river, but for a first time rafting we had a great experience I would recommend to everyone! Really fun day for first time rafters! My Fiance and I had never rafted before, so we wanted to go on a fun but easier trip and the Baron river was perfect for that. It had some slightly challenging rapids (in the middle of the dry season) and was a really good time. The highlight of the trip was our guide, Johann's I believe who took what would have been a good day and turned it into a great day! I would highly recommend doing this, or the Tully river if you get a chance in Cairns! If you go to Cairns then this has to be done..!!! White water rafting on the Tully river seriously was one of the best things i have EVER done.! Our guide was called Rod, he was an experienced rafter and made everyone feel at ease and a good laugh. Some of the views of the surrounding forrest were breath taking and if it wasnt for the rapids, you realy would sit and stare all day!!! Absolutely amazing! You won’t regret it! White Water Rafting wasn't something we planned to do when we went to Cairns but we heard it was fabulous so we signed up with RnR White Water Rafting which our hostel said was the best. It was definitely the most fun I have had in a long time and I would do it again in a heartbeat! We went down the Tully with our fabulous, hilarious guide Macca made the day absolutely perfect! You start off slow to get used to it and they are very good about safety! Stop farting around and just do it already, you won’t regret it! It is essentially a day tip out to Tully River where you spend well over 3 hours going through level 4 rapids and waterfalls. You will get to see some truly breathtaking views of the mountains, mist, river, waterfalls etc. I wouldn't recommend bringing a camera or anything valuable on the trip as you won't have anywhere to put it while rafting, plus you will get soaking wet. Do dress appropriately as advised by the website. Had a great time, rafted some awesome rapids. All round fantastic day! Wear shorts, cause its going to be an amazing bumpy full on ride of your life! The most fun I've had with my pants on. Actually they came off a couple times so it was an all-around good time! If you go to Australia you simply have to take a trip with these guys. None of us had ever done any type of water rafting before, so we were a little apprehensive. The guides however went through in great depth whilst we travelled to the location and also let us have a little practice when we got to the river. When we had passed all the rapids, there was even time for a nature and history lesson about the local area. Great fun with a wonderful company. I can highly recommend this Australian Adventure experience to all travellers visiting Queensland a must do in Cairns. A great Day spent with great people who make the experience truly and adventurous one. Excellent fun, exhilarating!! Sometimes scary but you know the instructors are extremely good at what they do so you know you're safe. All instructors had a great sense of humour and were friendly. Amazing scenery on the Tully river. well organised. I went rafting …. and I survived!!!! Although the water was a little low, the rapids were still great fun. I'd been rafting before in other countries, so was looking forward to this one too. There were 8 of us in the raft, 7 travellers and 1 instructor. Along with us there were several other rafts too, all heading down the Tulley river. With so many rafts, we often had to wait to others to catch up.It slowed the day down, along with the instructors having to get out to act as safety guides when the other rafts had to go down the rapids. This meant that we often had a lot of waiting. However the instructors kept us entertained and a few times we were allowed to drop into the river and float down stream in our lifejackets.